On 20 September 2012, Shila Amzah from Malaysia became the champion of Asian Wave, a "pop talent show" in Shanghai. Her delivery of a Mandarin song by Chinese pop star Na Ying-a brought the studio audience and the judges to their feet, and rendered the show's host Lin Hai speechless while Chinese composer Gao Xiaosong praised her by saying, "You gave me goose bumps. You broke my heart." She also sang Wang Leehom's Forever Love in one of the prelimilary rounds of Asian Wave. Shila sang three number one hits - Set Fire ToThe Rain by Adele, Grenade by Bruno Mars, and Gemilang by Malaysian Idol winner Jaclyn Victor-to scoop the most number of online votes from home viewers. With the success, Shila defeated five other finalists who are each from China, South Korea, Singapore, Thailand and India. Choking back tears of joy Shila said "To all my fans, thank you for making me feel so blessed. I will be here more often and I want to learn more Mandarin because it's a beautiful language." She is making arrangements to improve her Chinese, a language that she learned from pre-school until Year Three. Women in Space Exploration - Remembering astronaut Neil Armstrong 1930 - 25th August 2012. Neil Amstrong’s famous words just after stepping onto the moon’s surface. 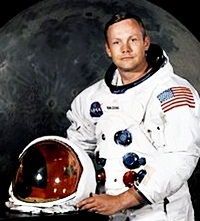 Armstrong became the first man to set foot on the moon on July 20, 1969. Armstrong died on 25th August 2012, aged 82years. We have yet to see the first woman land on the Moon, the last time man walked on the moon was in 1972. To date, out of 525 total space travelers, 56 women have flown in space. Last June 2012 United Nations Committee on the Peaceful Uses of Outer Space Concludes 55th Session in Vienna agreed to commemorate in 2013 the fiftieth anniversary of the first space flight by a woman, cosmonaut Valentina Tereshkova on 16 June 1963, with a special panel consisting of prominent women in the space-related fields of space exploration, science, technology, education, business and policy to address the contribution of women to space activities on the topic "Space: building the future today". Valentina Vladimirovna Tereshkova at the age of 26 years and 3 months, was the first woman and the first civilian to fly in space (1963). During the three-day mission, she performed various tests on herself to collect data on the female body's reaction to spaceflight. It wasn't until 1982 that the next woman flew in space. 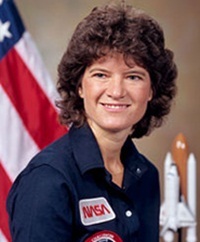 Dr. Sally Ride was 32 years old when in 1983 she became the first American woman to fly to space alongside four other crew members. 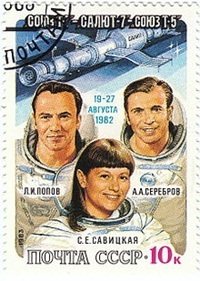 A year after her first voyage she successfully returned to space in the same shuttle for an eight-day mission. Dr. Ride died on July 23, 2012 of pancreatic cancer. 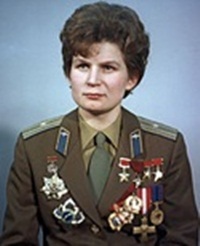 On July 25, 1984, Salyut 7 cosmonaut Svetlana Savitskaya became the first woman to perform a space walk and the second woman in space (Aug. 19, 1982) 19 years after Valentina Tereshkova. After graduation Svetlana pursued a career as a pilot. By 1972, she was licensed to fly an amazing 20 different types of aircraft. She set world records in supersonic and turbo-prop aircraft. Svetlana set the record as the first female to fly 2,683 km/hr in a MiG-21. 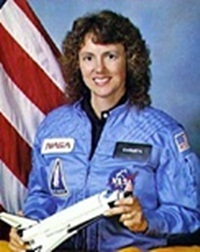 Christa McAuliffe was a Social Studies teacher from Concord High School, New Hampshire on board the 1986 ill-fated space shuttle “USS Challenger” that exploded only 73 seconds after lift-off. The Christa McAuliffe Planetarium, opened in 1990 in Concord, New Hampshire, carries on her vision of educating students of all ages about astronomy and space science. 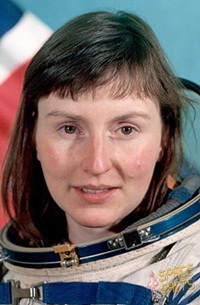 Helen Patricia Sharman was the first Briton in space, first woman to visit the Mir space station aboard Soyuz TM-12 in 1991. Sharman's tasks included medical and agricultural tests, photographing the British Isles, and participating in an amateur radio hookup with British schoolchildren. 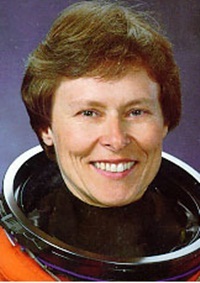 Roberta Lynn Bondar is Canada's first female astronaut and the first neurologist in space. Bondar flew on the NASA Space Shuttle Discovery during Mission STS-42, 1992, during which she performed experiments in the Spacelab. 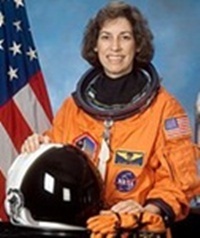 Ellen Ochoa became the first Hispanic woman in the world to go to space aboard the shuttle Discovery in 1993. A veteran of four space flights (1993, 1994, 1999, 2002), Dr. Ochoa has logged over 978 hours in space. 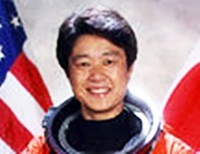 Chiaki Mukai is the first Japanese woman to fly in space, and the first Japanese citizen to fly twice. She flew aboard STS-65 in 1994 and STS-95 in 1998. Mukai has logged over 566 hours in space. 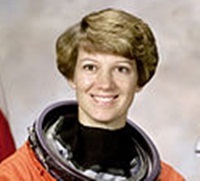 Eileen Collins was first woman to pilot a space shuttle in 1995 and in 1999 became the first woman to command a space shuttle. During STS-114, Collins became the first astronaut to fly the Space Shuttle through a complete 360-degree pitch maneuver. 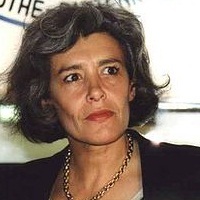 Claudie Haigneré, was the first Frenchwoman in space, a rheumatologist who flew to the MIR space station as an astronaut in 1996 and to the International Space Station (ISS) in 2001. On the MIR, she performed experiments in physiology, developmental biology, fluid physics and technology. Anousheh Ansari was the fourth overall self-funded space tourist, the first Iranian in space and the first self-funded woman to fly to the International Space Station in 2006. During her eight day on board the International Space Station, Ansari performed series of experiments on behalf of the European Space Agency. She also became the first person to publish a weblog from space. 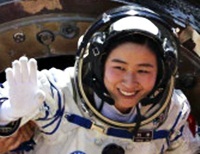 Astronaut Liu Yang, 33 became China’s first female astronaut sent on16 June 2012 for a 13-day mission to an orbiting module. Bank Negara Malaysia’s Governor, Tan Sri Dr Zeti Akhtar Aziz, maintains her position among the heads of the central banks named by Global Finance magazine as the World’s Best Central Bankers over the past year. Dr Zeti was one of the six heads of central bank scoring an "A" in the Central Banker Report Card published by Global Finance. She scored an "A" last year and also in 2010. The other heads of the central banks who maintained the "A" score include Amando Tetangco Jr of the Philippines, Taiwan's Fai-Nan Perng, Reserve Bank of Australia Governor Glenn Stevens, and Bank of Israel Governor Stanley Fischer. A newcomer was Mark Carney of Canada, who last year received a "B+". Meanwhile, the US Federal Reserve Chairman Ben Bernanke improved his score to "B" from "C" last year. The “Central Banker Report Card” feature, published annually by Global Finance since 1994, grades Central Bank Governors of 50 key countries (and the European Central Bank) on an “A” to “F” scale for success in areas such as inflation control, economic growth goals, currency stability and interest rate management. “A” represents an excellent performance down through “F” for outright failure. Subjective criteria also apply. Global Finance publisher Joseph Giarraputo says: “During one of the toughest years on record, the World’s Central Bankers were tested as never before.